Punjabi cuisine is distinguished by its famous ‘Tandoori’ style cooking – where a clay oven is used to cook the marinated meat, veg and tasty Naan (Indian flat bread). 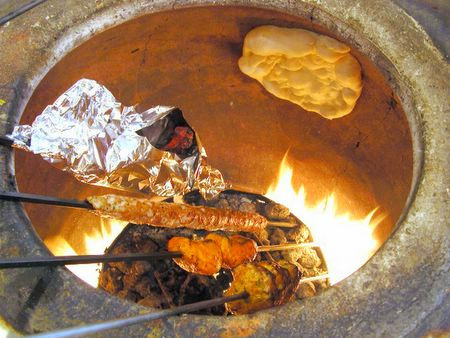 Our famous succulent Chicken Tikka is born out of this Tandoor – the clay pot oven. Chicken Tikka is prepared by marinating the chicken breast pieces in colourful spices and then slow cooked in Tandoor for that mouth melting taste! Punjab is the north western state of India, where food is the most important element of social thread. Its communal Tandoors, rich creamy dishes and a full glass of Lassi (the soothing flavoured buttermilk drink) and the festivals – speak aloud about the Punjabi food. The cold weather of Punjab encourages to prepare rich and tasty food that is creamy and provide enough nutrients for the hard work in the fields of rural villages. The famous Punjabi dishes like saag aloo, paneer palak, malai kofta, butter chicken and lassi are popular throughout the sub-continent. In the UK, we are well aware of Amritsari, Achari and Tikka Masala dishes that are so loved by us British! Methi (Fenugreek leaves) is widely used as fresh and dried to flavour the recipes. The sightings of mustard fields and the use of mustard in Punjabi cooking is also well known fact. The music, the dance and food – all are the important ingredients of Punjabi life – that is rich in celebrations, colours and tastes. Bhangra dance is now famous in the UK too to keep us fit and enjoy the beats of dhol at music festivals and weddings of Punjabi community. Most of the ingredients of Punjabi cooking are widely available here in the UK, now you got the tasty recipes also, here at Curry2Night, so nothing will stop us from trying these great tasting Punjabi recipes!